To answer the question what is a tax deed sale or auction, I should first explain that a tax deed sale or auction have existed in the United States for over 200 years. They are held in many states. This is a method let’s call it a process that allows the local governments to collect unpaid property tax. 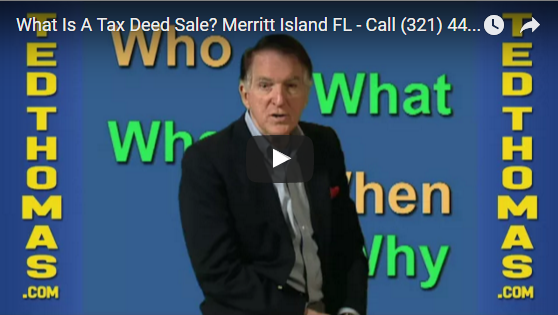 In the next video, from my extensive collection or training material I’ll explain in more detail the answer to, what is a tax deed sale or auction? You’ll find more information about investing in tax deed auctions at my website, that’s at tedthomas.com. This session will outline and give details of the who, the what, the where, the when, and the why of tax deeds. Most importantly I will show you how to make money with small investments. Together we’re going to discuss how you can make profits of 10,000 dollars, 20,000 dollars, all the way up to 100,000 dollars by learning how to purchase tax defaulted real estate and we’ll do that at wholesale prices paying only pennies on the dollar as little as just the back taxes. I’ll start with a brief history. First of all, every piece of land in the United States is owned by the federal government. The federal government allows you and me to have rights of ownership as long as we pay the taxes. Local government is mostly funded by revenue from property taxes. Now I’m not talking about income taxes that you pay the IRS and I’m not talking about state taxes. Today we’re going to talk about property taxes unbelievable as it sounds thousands of people neglect to pay property taxes. In the United States if you don’t pay taxes the government has remedies. Tax defaulted properties end up at auction and that’s where savvy investors buy the properties with starting bids of just back taxes. The local government memory for non-payment of taxes is at tax defaulted auction. Tax deed auctions take place in about half the taxing districts in the United States. In most cases the auctions are by public or bid. Anyone can buy at the auction. To qualify is simple. The rules vary at each auction but in general you may need to register it before bidding but definitely if you’re the winning bidder you need to immediately pay for the purchase. Basically that’s it. Any amount of money can buy the tax defaulted auction. The secret is to know the who, what, where, when, and why and how the tax auction takes place. That’s what my tax deed training is all about. For example, who has auctions? Well, the county governments in all states are authorized to auction property for unpaid back taxes. What is happening at the auction? Well the county is selling vacant land, homes, farms, commercial properties, the starting bid is always the amount due the local government for delinquent back taxes plus the penalties. Where do the auctions take place? Normally at the county offices the location is announced well in advance. Why? Well they have those auctions to collect back taxes. How? Well the rules vary from state to state. Let me briefly cover what you need to do before bidding at a tax auction. You need to know what you are buying. That involves details like the size of the property, what is built on it, the zoning, restrictions, easements, property taxes, tax appraisal, previous sale prices, and most importantly what’s the current condition of the property. The next thing you need to know is how to sell. The exit strategy is important. Now let me give you some idea about this competitive advantage. At the tax defaulted auction bidding starts at the back taxes. We’re all bargain hunters so we plan to buy property at close to back taxes, let’s say 20% to 30% of the retail value, the low price gives us a competitive advantage when compared with regular real estate or traditional real estate that’s for sale. Let’s not spend a lot of time fixing houses. No toilets, tenants, termites, or trash. This is an exit strategy that’s really important. Ted Thomas shows you in 10 simple steps how you can invest in your first tax-lien certificate. Best crew ever the most educational workshop i have ever attended. Highly recommend for anyone that wants to learn the meaning of lien & deed certificates. Testimonials on this site are from Ted Thomas' past and current clients. They are NOT representatives of "TYPICAL" or "AVERAGE" client's experience and only provide information about that individual's UNIQUE experience at the time the testimonial was provided. All claims have been documented as accurate. There is NO guarantee that you will make any money. "We made over 30% on our money!!" Just 13 days after I received Ted's home study course I bought a tax defaulted property for 31 cents on the dollar!! Renting out at $800 monthly... That's 30% on our investment, plus we own a $100,000 home! Are You Getting These Kind of Results From Your Investments? "My friends are making $1,000s using this simple government sponsored program." Karen at auction paid $17,600 for this property...assessed valued $48,000! 12 Cents on the Dollar!! I Made Over 20% in 31 Days!! "Poor people have large TVs and rich people have large libraries" Profit...$34,000.00 in 11 days.. How long would you work at your job to earn this kind of income! Sign Up Below And Get On The Way To Buying Your First Tax Lien Certificate!